For 386 & 486 machines only. A continuity tester is one of the most useful pieces of test equipment to have. It is used for testing the electrical continuity between two points. Our tester will "buzz" up to a specified resistance or less. Two on-board resistance ranges available. Full theory of operation given. The user may adjust the resistance ranges to suit his own requirements. The kit is driven from the Parallel Printer port of a PC using a straight thru M/F 25 pin cable. These are readily available. There is no software Registration, as a programmed chip is supplied in the kit, and the PC driver software is free. For volume programming and maximum flexibility the kit requires one on-board wide-slot 40-pin ZIF socket. The software tells you where to place the PIC you are programming. (Note some older designed PIC programmers available like the Warp-13 have 2 or even 3 (!) ZIF sockets on-board. Only one wide-slot 40 pin ZIF socket is necessary with PICALL.) The reason the 40 pin ZIF socket is not included is because these are manufactured in north America while the kit is packed in Hong Kong. Since most kits are sold in Europe & north America it is cheaper if you buy the socket locally. K117. PICALL for Windows software. V0.10c. november, 2001. 750K. Latest. All the Error Messages are now in Help of the Hardware Settings and Testing. Sample batch file to help automate volume programming. Change it to suit your tastes. term.zip No frills terminal program to program Kits 121 & 122. Easier than using Hyperterminal. DOS based but will run under W9x. To program 20-pin DIP - 90S1200, 90S2313, and 40-pin DIP - 90S4414, 90S8515. Programs at 9600 baud. Parallel mode. With the optional adaptor board you can now program AT90S4434 and AT90S8535. It will not program the 8-pin AVR devices (90S2323, 90S2343). 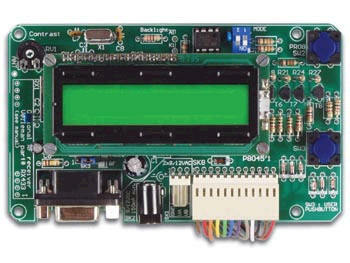 Adaptor board for K122 to program 90S4434/8535. term.zip No frills terminal program written by Frank to program Kits 121 122 and 123. Easier than using Hyperterminal. DOS based but will run under W9x. This is an enhanced K117. It will program some Scenix uC's, Atmel AVR's and EEPROMS. See picallw.com for lists of the uC's it will program. In addition it has an header for USP programming of PICs and Atmels. A 6-pin header and harness come with the kit. June, 2002. K144 now supports PIC18Xxxx chips. Get the latest software for PICALL for Windows software. V0.13c. october, 2002. July 4, 2002. K144 now support programming PIC18Fxxx chips. You must use the latest software for PICALL for Windows software. V0.12c. May, 2002. A small hardware addition is needed for K144. No hardware change is needed for K96. New chipinfo.dat file with data for 18F452 and 18F252. It has a B USB connector put on it as well as a 6 pin ICSP connector. PC Parallel port programmer for the 24xxx, I2C bus and 93xxx EEPROMS. 8 bit programming mode only. We use a 24C16 Software in the Christmas Tree Kit 103 so that was the main reason we did the kit. 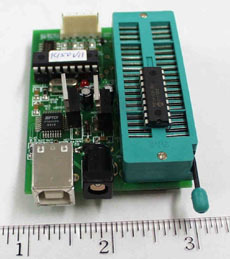 A 16 pin ZIF socket is used on-board. The top 8 pins are for the 24xxx; the bottom 8 are for the 93xxx SPI EEPROM's. Kit 182 is Kit 128 without the ZIF socket. It is thus a Flash ICSP Programmer operating from the USB port. It will be sold fully assembled as most of the components are surface mount. The board is only 48 x 30mm. There are 4 nylon 10mm standoffs to protect the underside. USB 'B' female connector. dimensions: 132x65x20mm / 5,23 x 2,57 x 0,79"